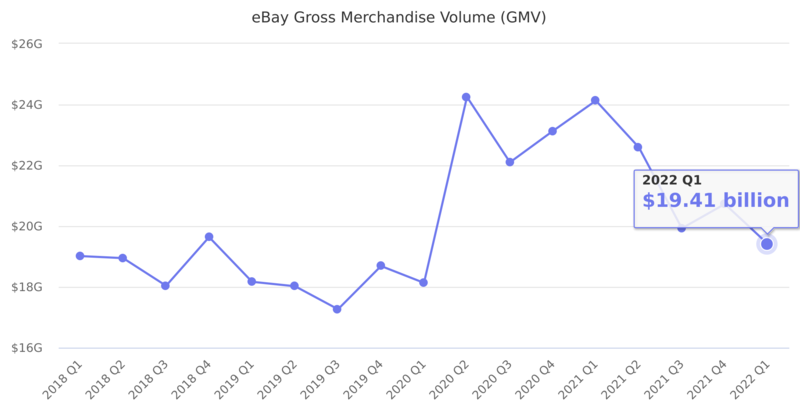 Total sales for all eBay marketplaces. Total value of all successfully closed transactions between users on our Marketplace platform during the period regardless of whether the buyer and seller actually consummated the transaction. We believe that GMV provides a useful measure of the overall volume of closed transactions that flow through our platforms in a given period, notwithstanding the inclusion in GMV of closed transactions that are not ultimately consummated. Last reported quarter 2018 Q4 it was $23.23 billion, up by 1% year-over-year from $22.99 billion. From $83.88 billion in 2017 it increased by 7% to $89.83 billion in 2018.